You definitely have come far when you are down to taking an EPSO Case Study. After contending with a number of selection procedures, you have finally come and passed through the first initial tests. However, the journey is still not over. You are now in the assessment centre phase. That means you have met the eligibility requirements and scored one of the highest overall combined marks for the preselection tests. It is time then to test your general and specific competencies through four tests. One of those is the case study. As you have come far already, let us not put your efforts to waste and ace the EPSO Case Study test. We have written down some of the fundamentals that you must know before taking the test, ensuring that you’ll enter the competition not as a deer in the headlights. So let us cut to the chase and dive in! 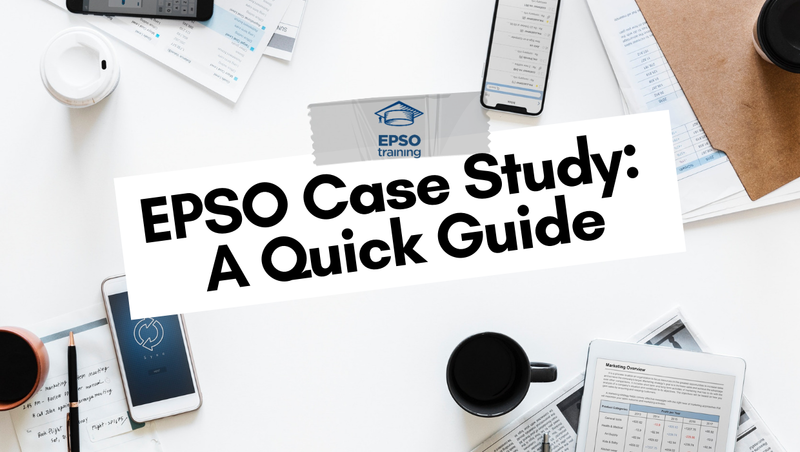 What Is EPSO Case Study All About? The EPSO Assessment Centre is where all of your preparations have come down to. Here, you will be assessed for your ability to work both in teams and independently. In the case study exam, you will be tested on the latter. However, before going in deep, it must be noted that not all competitions have a Case Study. So, it helps to check what kind of competition you are in before proceeding. For some AST competitions, for example, the case study is often replaced by an In-tray exercise. Moving back, the Case Study is not eliminatory—unlike some of the tests you have to take. But this does not mean that you must not give it your all. Among all of the exercises done in an assessment centre, the Case Study holds 39% of the wright, followed by an interview with 28%, while the rest—Competency-based Interview, Oral Presentation, Group Exercise—holds 11% each. Furthermore, those competitions where the professional competencies are only scored with the Case Study, then your score has to exceed the pass mark. Analysis and Problem Solving – the ability to identify critical facts in complex issues and develop creative and practical solutions. Delivering quality and Results – the ability to take responsibility and initiative for delivering work to a high standard of quality within set procedures. Communicating – the ability to communicate clearly and precisely both orally and in writing. For those taking the EPSO Case Study under the AST Competitions, you can expect the test to cover about what is expected of an assistant at the EU institutions depending on the profile you are applying for. As such, you can gather how the test will involve information related to the task that you will perform for the job. In order to fully grasp on what you can expect the AST EPSO Case Study test is about, it helps to go over the Notice of Competitions. It is where the specific tasks and duties are written down. If this feels intimidating, you do not have to worry. All you need to do is get yourself familiarized with the tasks at hand from the perspective of a future administrator at an EU institution. Therefore, it helps to carefully go over the Notice of Competitions before taking the test. The EPSO Case Study is a computer-based test wherein candidates are given a relevant scenario and are faced with various problems that they have to solve or react based on the provided material. As such, this competition will attempt to mirror the frequent task for an EU official such as writing reports, recommendations and executive summaries or a topic for their supervisors. In this test, candidates will analyse a problem, interpret data, consider alternatives and produce a written report describing their solutions or recommendations. Though computer-based, you must take note that some competitions ask candidates to produce a hand-written document. Marker – the marker is a specialist in the field of the competition that will assess the case studies of the candidates. This structure will easily show your answers to the markers. It will clearly showcase your solutions to the problem without giving people a hard time to look for and understand them. Furthermore, writing an Introduction and a Conclusion will give the impression that you are not pressed for time since it rounds the essay with a beginning and an end. We recommend that the length of your essay should be around one page per requested topic outlining three positive aspects about the selected solution and one negative or questionable aspect and putting those in balance. Make sure that through your report, you have demonstrated the two (for Administrators) or four (for Assistants) key competencies assessed in the case study. In order to practice what you have just learned, then a good mock case study is for you. However, you must note that case studies are profile specific. They range according to Audit, IT, Policy Writing, Finance, and more. So, make sure you check properly the profiles just as you check the how-tos of the test. Get to Know Europe – Familiarize yourself with Europe—from the EU issues to the EU Institutions. This way, you can quickly understand the context of the simulations given to you. 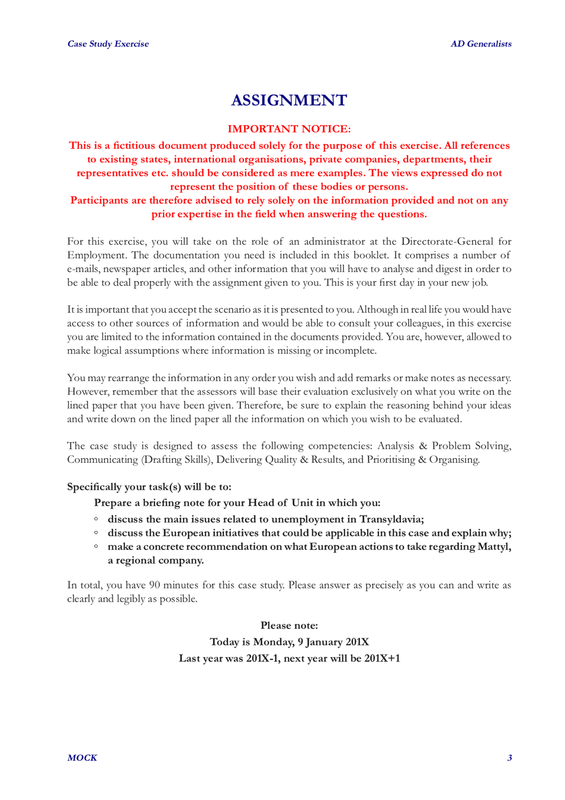 Read Up the Notice of the Competition – Go back to the notice of the competition since this will give you an overview of the kind of role expected for the certain position you are going for within the EU institution. As mentioned above, the subject of the case study reflects the tasks and duties expected of the position you are going after—either as administrators or as assistants. Take Mock and Demo Tests Online – Part of the preparation process is practice. In fact, it is one of the most vital component whenever you enter an EPSO competition. You can visit several websites available online that provide mock exams and demo tests. You can even visit EPSO’s main website itself and answer the sample tests they have provided. This will give you enough background to know how the case study will go as well as a hands-on experience in taking the case study exam. Go Over the Instructions – During the actual test, always remember to read the instructions/assignment carefully. Make sure that you understand the mission, the question, and your role. Never allow yourself to forget about the given information. Remember that every piece of information counts. Do not take anything for granted. Practice Speed-reading – Since there is a time limit, you must effectively communicate what you want to say with the correct information backing it up. By speed-reading, you will understand fast as well as answer correctly. It will also take off the burden of time-pressure from your shoulders, allowing you to think more clearly. Outline, Outline, Outline – Nothing makes your essay flow well than an outline. Here, you can see the skeleton and an overview of your essay. It will keep you from going off track as well. Write Your Main Ideas – Write down the key sentences in every paragraph before the rest. This way, you will stick to the point without veering off. Plan Your Time – Though the competition already has a time limit, you must set the given time properly as well. Always make room for a couple of minutes for rereading and revision. This way, you can correct some typos while eliminate those that do not serve your essay. Simplicity Is Key – Make your sentences as simple as you see fit. Do not overburden yourself and the marker by writing long-winded sentences that may not see the end of the day. Make sure that your sentences are understandable and serve their purpose.